For six years you are to sow your fields and harvest the crops, but during the seventh year let the land lie unplowed and unused. Then the poor among your people may get food from it, and the wild animals may eat what they leave. Do the same with your vineyard and your olive grove (Exodus 23:10-11). When you reap the harvest of your land, do not reap to the very edges of your field or gather the gleanings of your harvest. Do not go over your vineyard a second time or pick up the graps that have fallen. Leave them for the poor and the alien. I am the Lord your God (Leviticus 19:9-10). He who gives to the poor will lack nothing, but he who closes his eyes to them receives many curses (Proverbs 28:27). The righteous care about justice for the poor, but the wicked have no such concern (Proverbs 29:7). In the New Testament, we see the same call of compassion for the poor from Jesus and the leaders of the early church. Then the Lord said to him, "Now then, you Pharisees clean the outside of the cup and dish, but inside you are full of greed and wickedness. You foolish people! Did not the one who made the outside make the inside also? But give what is inside the dish to the poor, and everything will be clean for you" (Luke 11:39-41). "Do not be afraid, little flock, for your Father has been pleased to give you the kingdom. Sell your possessions and give to the poor. Provide purses for yourselves that will not wear out, a treasure in heaven that will not be exhausted, where no thief comes near and no moth destroys. For where your treasure is, there will your heart be also" (Luke 12:32-34). When Jesus heard this, he said to him [the rich ruler], "You still lack one thing. Sell everything you have and give to the poor, and you will have treasure in heaven. Then come, follow me" (Luke 18:22). Now that we have seen that there is a Scriptural mandate to give to the poor, there are a number of giving avenues available to us in which we can give help to those in need. Your church's general budget. Some churches do not operate on designated gifts. They funnel all of their offerings through their general budget. If your church operates in this manner, check and see if your church has budget line items to help those who are poor in your community. Your church may also have specific line items in their missions budget that support para-church ministries that help the poor. Through your faithful giving to your church's general budget, you will be helping to fund these budget line items. Church designated offerings. Many churches operate with a "benevolence fund" in which designated money is given to help those who are poor. My own church has a tradition of taking up a benevolence offering for the poor each time we take The Lord's Supper in a service. This is an opportunity to give specifically to help the needs of the poor. In house church organizations. Some churches establish non-profit organizations that operate on the property of the church. These are ministries not specifically funded through the church budget. Para-church organizations. These are faith-based organizations that would include homeless shelters, child care, domestic violence, disaster relief programs,food pantries, and clothing closets. They normally exist outside a specific church or denomination. Many times, churches will take on a para-church organization as part of its missions budget line item. Other non-profit charities. These would include any charitable organizations outside the realm of "faith-based." On the spot giving. When you come across someone in need, you have an opportunity to give to them. Designate your offerings. If your church has designated offerings for benevolence or a specific ministry to the poor, then consider designating a separate offering above the tithe each time that you give. Give of yourself to a church ministry or para-church organization. Consider volunteering your time, energy, and abilities to ministries that help those in need. These ministries depend on people donating their time and energy to do the work of the ministry. Donate major assets. Most major non-profit ministries to the poor have the capacity to accept large, non-cash personal assets such as cars, RVs, boats, and jewelry. If you have any of these items that you no longer use or need, consider donating them to help others in need. Donate clothing or other household goods. Goodwill and The Salvation Army are two non-profit charities that come to mind that have generated millions of dollars for the poor through selling America's unwanted clothing and household items. Instead of going through the hassle of a garage sale, why not donate your unwanted items and generate a few hundred dollars for a worthy cause? You can also use your gift as a tax deduction. Purchase clothing or household goods from charities. Flip #4 around. So, instead of donating your unwanted items, why not walk into these charities' stores and purchase some used, donated items that you may need for your home? Purchasing these items will provide cash flow to help the poor. It could also save you some money in your family's budget. On the spot giving to charities who are fundraising out in the community. We've all seen these groups from time to time. They camp out in front of your local grocery store or superstore. Once you finish shopping, consider giving them a few dollars on your way out to your car. On the spot giving to the poor in your community. 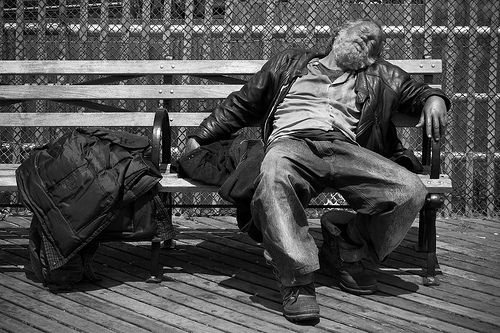 Depending on where you live, you may run into homeless, hurting people on a regular basis. Consider setting aside a few budget dollars each month and carrying that money around with you in your wallet. As the need arises, purchase a meal, buy some gas, or give some cash to help those who are less fortunate. God wants His children to help those who are "down and out." Our giving to those who are hurting is a demonstration of the love of Christ to a lost and dying world. He wants us to use our time, energy, abilities, and finances to help others. Look for opportunities to be the hands and feet of Jesus and love those who are less fortunate. The Lord Himself said, "And if anyone gives even a cup of cold water to one of these little ones because he is my disciple, I tell you the truth, he will certainly not lose his reward." Go out this week and be a blessing to others. As you bless those around you, you will receive a blessing as well! Have you even graduated to training wheels in your giving? Hey Larry. I didn't know about #3 - designating assets. that is a good one. Thanks, Jay. Glad you enjoyed the post, and I'm happy to see that you have a blog going as well. Keep up the great work!